The mountains of Sicily are extraordinary. The sea often takes center stage, but once you’ve spent time in the heart of Sicily, you’ll become a confused lover–mountains or sea? Sea or mountains? Today, Melissa Muller with whom we are hosting our May 19-31, 2016 tour, “Experience Sicily with Chef Melissa Muller,” and I spent a superb day together in the sublime mountains scouting out places we’re planning to take our guests. One of the sites we visited was an antique gristmill in Roccapalumba. This photo is of the mountain-spring-fed river that at one time created the hydro-power to propel the mill. It’s a beautiful site with a caretaker who is quite a character! He carefully described the ancient processes of creating flour from Sicily’s cereals and discussed the bread that Sicilians make from such nutrient-rich grist… For a full explanation, you’ll have to come with us in May. Melissa and I, along with our local guide Sebastiano, can’t wait to host you! Contact me today at allisonscola@experiencesicily.com to reserve your spot on this exclusive tour. 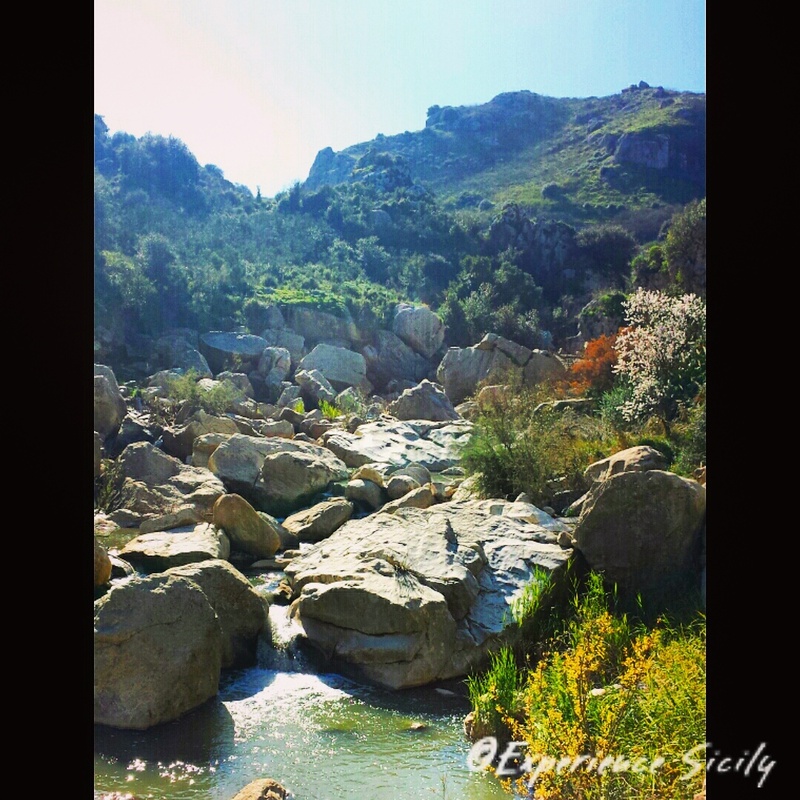 This beautiful mountain scene is so typically Sicilian…sunny, verdant, sandy, rocky, textured. Can’t wait for your sensational tour in May.